Prince William Sound Science Center (PWSSC), and Sitka Sound Science Center (SSSC), have been engaged in scientific data collection and analysis services requested under contract with the State of Alaska for a project entitled "Interactions of Wild and Hatchery Pink and Chum Salmon in Prince William Sound and Southeast Alaska". This contract work began in March, 2011, and is expected to continue through 2023. The State of Alaska provided capital funds to initiate the project with additional primary funding provided annually by salmon processors and fishery enhancement organizations. The State continues to contribute to through significant in kind work and by securing grant funding. 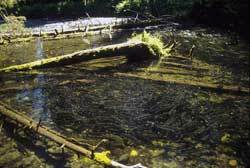 The overarching purposes of this research are to: 1) further document the degree to which hatchery pink and chum salmon straying is occurring; 2) assess the range of interannual variability in the straying rates; and, 3) determine the effects of hatchery fish spawning with wild populations on the fitness of wild populations. This research project has been subdivided into four major activities for implementation, each with a separate project leader: ocean sampling near PWS; stream sampling in PWS; stream sampling in SEAK; and data management, analysis, and reporting. Reports made to ADF&G, as described in the Request for Proposal (RFP), will be posted below. Reports will consist of a complete description of preceding field data methods and the data collected. Reports will include any analyses that can be made with the data available up to that time. Reports will be progressive, i.e., will include all data and analyses from the beginning of the project up to the date of the report. 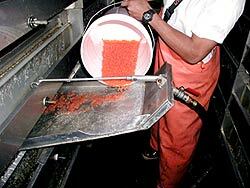 Alaska Hatchery Research Project workshops will be held periodically to provide the public and department an overview of the progress made and challenges encountered, and so that mid-course adjustments can made if necessary. The agenda and presentations from workshops are posted here for your information. Technical documents (Tech Docs) are produced by ADF&G Gene Conservation Lab (GCL), Mark Tag and Age Lab (MTA) and the Cordova Otolith Lab to describe and document procedures and protocols utilized to process samples and data for the Alaska Hatchery Research Project. Tech Docs are also utilized to document decision points throughout the project. As Tech Docs are finalized they will be posted here. The long-term research project proposed here has the potential to answer some of the questions most relevant to the Alaska salmon enhancement program. As good stewards of wild salmon stocks and the natural resources of the state, ADF&G believes strongly this work should be undertaken. It recognizes that the results will likely have some ambiguity and may even be interpreted differently by some groups. Nonetheless, this information will likely guide future decisions and will greatly advance the understanding of the ecological and evolutionary dynamics of wild and hatchery interactions.